February 11 (Ticker Report) Ontario Teachers Pension Plan Board raised its stake in Turquoise Hill Resources Ltd. (NYSE:TRQ) (TSE:TRQ) by 35.4% during the third quarter, Holdings Channel reports. The fund owned 158,106 shares of the company's stock after buying an additional 41,316 shares during the period. Ontario Teachers Pension Plan Board's holdings in Turquoise Hill Resources were worth $467,000 at the end of the most recent quarter. Several other large investors have also bought and sold shares of the company. Bourgeon Capital Management LLC increased its stake in Turquoise Hill Resources by 1.6% in the third quarter. Bourgeon Capital Management LLC now owns 87,325 shares of the company's stock valued at $259,000 after buying an additional 1,369 shares during the last quarter. Bank of New York Mellon Corp increased its stake in Turquoise Hill Resources by 0.3% in the third quarter. Bank of New York Mellon Corp now owns 1,158,511 shares of the company's stock valued at $3,441,000 after buying an additional 2,928 shares during the last quarter. World Asset Management Inc increased its stake in Turquoise Hill Resources by 8.1% in the third quarter. World Asset Management Inc now owns 134,598 shares of the company's stock valued at $400,000 after buying an additional 10,047 shares during the last quarter. Great West Life Assurance Co. Can increased its stake in Turquoise Hill Resources by 1.4% in the third quarter. 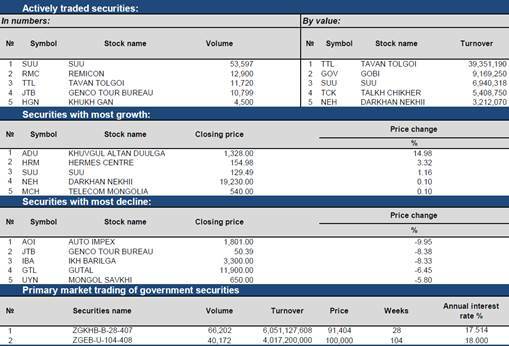 Great West Life Assurance Co. Can now owns 759,168 shares of the company's stock valued at $2,242,000 after buying an additional 10,776 shares during the last quarter. Finally, Global X Management Co. LLC increased its stake in Turquoise Hill Resources by 4.0% in the third quarter. Global X Management Co. LLC now owns 399,450 shares of the company's stock valued at $1,186,000 after buying an additional 15,298 shares during the last quarter. 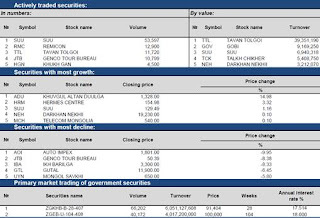 30.56% of the stock is owned by institutional investors. 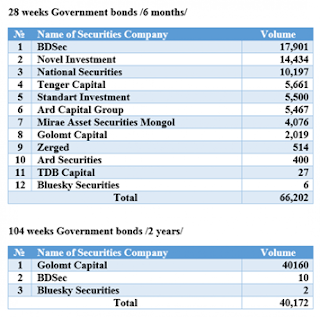 February 14 (MSE) On 14 February 2017, the 28 weeks Government bonds /17.514% annual coupon rate/ and 104 weeks Government bonds /18.000% annual coupon rate/ total worth MNT10.6 billion traded at Mongolian Stock Exchange. February 15 (MSE) According to the Resolution No. :1 of Board of Directors meeting, dated on 9 February 2017, "Takhi ko" LLC decided to distribute dividends sum of MNT128.5 million or MNT108.00 per shares from net profit from 2016. "Takhi ko" LLC will be transferred the dividends to shareholders' accounts at Mongolian Central Securities Depository within 1 May 2017. February 15 (MSE) According to the Resolution No. :2 of Board of Directors meeting, dated on 10 February 2017, "Govi" LLC decided to distribute dividends sum of MNT1.5 billion or MNT200.00 per shares. "Govi" LLC will be distributed dividends to shareholders as a cash at company's building or transferred to shareholders' accounts at Mongolian Central Securities Depository starting from 20 April 2017. February 14 (Bank of Mongolia) Spot trade: Commercial banks bid weighted average rate of MNT2483.31 for USD10.6 million and weighted average rate of MNT357.42 for CNY57.6 million respectively. The BoM did not accept any bid offers. February 14 (Bank of Mongolia) Following is the public report of the January 2017 results of the "Housing Price Index" (HPI) research conducted independently by Tenkhleg Zuuch LLC at the request of Mongol Bank. The research shows that the general index of housing price was at -1.93 percent in January 2017. It shows a decline by 2.83 percent compared to the previous month. The general index dropped by 2.83% compared to the starting period, and by 7.18 % compared to the same month in previous year. Below are the Price index indicators classified by new and old houses. The new house price index was at 12.71 percent. This shows a decline by 2.43 percent compared to the previous month. The index dropped by 2.43% compared to an earlier period of this year, and by 4.65% compared to the same month in previous year. HPI was calculated by applying Hedonic regression methods and the calculation was based on the information available for 4987 old and new houses supplied for sale at the real estate market of Ulaanbaatar for the particular month. February 14 (Mongolia Metals & Mining) Mongolian National Broadcaster TV(MNB) has broadcasted in its Evening News on Feb.14th that Parliament Chairman M.Enkhbold, who is campaigning in Western provinces, has said that by preliminary calculation growth in 2016 was 0.01%. · Key challenge for 2017: GoM must deliver >=3% growth by implementing ERP. 1% here and there does not really matter. National Statistics Office of Mongolia will release 2016 GDP growth results on preliminary basis tomorrow, Feb.15th. I will provide coverage. February 14 (gogo.mn) Government of Mongolia is negotiating with International Monetary Fund (IMF) on Stand-By Arrangement (SBA). Minister of Finance B.Choijilsuren paid visit to the United States last week to meet with IMF representatives. Minister of Finance stated that final decision and the amount of loan will be finalized this week. IMF have submitted 13 proposals on operation of Development Bank. In regards, amendments to draft law on Mongolian State Development Bank was approved by the Parliament session last week. IMF's SBA was created in June 1952 to provide financing to countries requiring help with balance of payments problems. The SBA has often been used by member countries and is the dominant lending instrument of the IMF, especially for emerging market countries. After a significant pause in such aid, the financial crisis that erupted in 2008 resulted in a large number of countries requiring such financial assistance from the IMF. The financing terms are normally more advantageous than private markets offer. In 2009, the IMF upgraded the SBA "to be more flexible and responsive to members countries' needs." At the same time, the borrowing limits were doubled and more funds were made available up front. Generally, the "conditions were streamlined and simplified. HOW MANY TIMES MONGOLIA REQUESTED SBA? IMF provided SBA to Mongolia twice and granted total of US$ 195.7 million loan, of which US$ 136.6 million was granted as an ordinary loan without adjustment. Government of Mongolia received the first SBA in 1991, the early stages of transition to a market economy. The main goal of the IMF supported SBA was to support balance of payments, promote economic stability and reduce unemployment. The SBA was approved for an amount equivalent to SDR 13.75 million. Affected by the global financial crisis, price of Mongolia's main mineral exports such as copper and zinc have fallen sharply in the world market in mid-2009, causing declines in state revenues. Thus the Government of Mongolia requested an SBA with the IMF in support of its efforts to overcome the economic and financial crisis in Mongolia in March 2009. The Executive Board of the IMF approved a 18-month SBA for Mongolia in an amount equivalent to SDR 153.3 million (about US$229.2 million) with an annual interest rate of 5 percent to support the country's economic stabilization program. As a result, economic growth reached -1.6 percent in 2009. MELBOURNE Feb 15 (Reuters) - London copper prices steadied on Wednesday to trade above the key $6,000-mark for a fourth session, buoyed by supply worries even as talks were set to resume between striking miners and BHP Billiton at the world's biggest copper mine in Chile. * Three-month copper on the London Metal Exchange had edged up 0.3 percent to $6,040 a tonne by 0109 GMT, following 1.4-percent losses the session before. * Prices powered through the $6,000-level on Friday after BHP declared force majeure on shipments from the Escondida mine, to hit the highest since May 2015 at $6,204 a tonne on Monday. * Striking workers at Escondida and BHP said they had agreed to renew talks on Wednesday. * Shanghai Futures Exchange copper kept 2-percent losses at 48,920 yuan ($7,126.11) a tonne. * Also throwing up headwinds for commodities, the dollar stood tall on Wednesday after Federal Reserve Chair Janet Yellen signalled a faster pace of U.S. interest rate increases at her two-day testimony before Congress. * Peru will start the bidding on a nearly 100-year old polymetallic smelter and a copper mine at about $270 million in a March 10 auction, the government said on Tuesday. February 14 (MINING.com) After a pause last week (and even a small move higher) following 12 weeks of non-stop selling, the rout on coking coal markets resumed on Tuesday. The steelmaking raw material fell 4.7% to $154.80 on the day, the lowest since early September. Met coal is down more than $150 below its multi-year high of $308.80 per tonne (Australia free-on-board premium hard coking coal tracked by the Steel Index) hit in November despite customs data showing a huge jump in Chinese imports. China forges more steel than the rest of the world combined and the country last year imported 59.2 million tonnes of coking coal, an increase of nearly 24% over 2015. 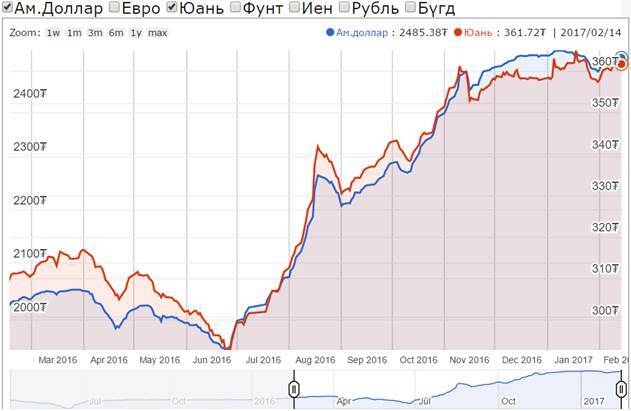 However, as TSI points out in its latest review of the market Mongolia accounted for 23.6 million tonnes of total imports as imports from Canada and Russia declined by 9.3% and 19.4% respectively while the US exported no coking coal to China. Mongolia increased production by 85% last year. With domestic output curtailed by Beijing, so feverish was Chinese demand that Mongolian trucks carrying steam and met coal created the world's longest traffic jam on the border between the two countries. But it's not the volume of Mongolian exports that should worry producers in Australia and elsewhere, but price. As a captive supplier (and due to a deal struck by Ulaanbaatar to use coal exports to pay down debts owed to Aluminum Corporation of China, or Chalco) land-locked Mongolia sells its coal for much less than the seaborne price. At the height of the price boom in November Mongolian coking coal went for as little as 75% below the spot price (thermal coal sold for less than a third of Australian benchmarks) and nowhere near the benchmark contract prices for the Q1 2017 settled between Australian miners and Japanese steelmakers at $285 a tonne. Another low cost supplier to China, North Korea may also impact the price this year. Under UN sanctions the dictatorship's export of coking coal – all of which goes to China –would be limited to 7.5 million tonnes this year, down nearly two thirds from the 2016 tally. But Beijing has in the past ignored some UN sanctions on the basis that it would hurt the civilian population of North Korea. Despite the pullback metallurgical coal is still trading at more than double multi-year lows reached this time last year. Coking coal averaged $143 a tonne in 2016 (about the same as it did in 2013). Consensus forecast is for the price to average about the same in 2017. In 2011 floods in key export region in Queensland saw the coking coal price briefly trade at an all-time high of $335 a tonne. Go to Frontera News for more on Mongolian coal traffic jam. February 14 (Australian Financial Review) Australia's biggest iron ore miners are set to benefit from a "fundamental shift" in China's demand for higher grade iron ore, which has sent spot prices rocketing and could keep them high for some time yet. The benchmark iron ore price reached a 30-month high of $US92.23 per tonne on Tuesday, and the commodity's strongest start to a year since 2014 is fuelling expectations for rising dividends from mining companies and dramatically improved revenues to the federal and Western Australian government. The timing of the rally is particularly good for WA Premier Colin Barnett, who will face voters at an election in less than a month and can expect iron ore royalties to deliver billions of dollars of extra revenue into the state's struggling finances over the next few years. Executives from Rio Tinto, Fortescue and Cliffs Natural Resources have all noted in recent days that Chinese customers have been increasingly seeking ore with high iron content; such as the 62 per cent iron product that Rio sells from WA and the 65 per cent iron product Vale sells from the Carajas region of Brazil. Rio chief financial officer Chris Lynch said this week there was a "fundamental shift going on in China" as the middle kingdom strives to ensure its steel mills are more efficient and less polluting. Rio believes that push will see a shift toward higher grade iron ore, and Lourenco Goncalves, the chief executive of Cliffs Natural Resources agrees. "Between the improved profitability of the Chinese mills, the elevated prices of coking coal and most importantly the increasingly serious crackdown on pollution sponsored by the Chinese government, demand for higher grade iron ore has risen significantly," Mr Goncalves said in a recent briefing with analysts. The recent rally in iron ore prices has been unusual in that it has coincided with rising iron ore stockpiles in China, and Mr Goncalves said those stockpiles were full of low grade iron ore that was struggling to find a buyer. "Previously, when the Chinese mills were not being forced to pay attention to pollution and coking coal prices were extremely low, low iron content didn't matter. Now it does matter, and that is why we continue to see higher ore inventories at the ports," he said. Fortescue Metals Group's marketing boss David Lui agreed that high coking coal prices and the pollution reduction push were driving demand for higher grade ore, but he said the phenomenon would be temporary. "We envisage this short-term utilisation chase will decelerate soon as the winter is coming to an end and the coking coal price continues to come back to a more sustainable level," he said. The rush for higher grade iron ore has seen the discount applied to lower grade products expand rapidly in recent weeks, but UBS commodities analyst Daniel Morgan believes the demand and premium paid for higher grade product will ease in coming months. "As you get past winter I think both those two drivers, pollution and the coking coal price, I think that will weaken and therefore you will see the (price) spreads return to something more normal," he said. Mr Morgan said the price surge was also partly due to seasonal and cyclical factors, as steel mills stock up on iron ore after Chinese New Year. "I think there is quite a bit of demand in China at the moment, steel production and steel consumption have been pretty strong for months, and primarily I think that is the reason for prices to be higher," he said. Futures trading in the Chinese cities of Shanghai and Dalian were suggesting the iron price could be lower by the end of the week. NEW YORK/LONDON, Feb 14 (Reuters) Gold came off its highs on Tuesday, as the dollar advanced after U.S. Federal Reserve Chair Janet Yellen said the central bank will likely need to raise interest rates at an upcoming meeting with the economy expanding further. The Federal Reserve chair struck a more hawkish tone than investors had expected, although she did flag considerable uncertainty over economic policy under the new administration. U.S. President Donald Trump's national security adviser Michael Flynn resigned on Tuesday over revelations that he had discussed U.S. sanctions against Moscow with the Russian ambassador before Trump took office. Spot gold traded 0.4 percent higher at $1,229.49 an ounce by 2:36 p.m. EST (1936 GMT), while U.S. gold futures settled down 0.03 percent at $1,225.40. The dollar index reached the highest in more than three weeks following Yellen's prepared remarks before the Senate Banking Committee, while Wall Street rose to a record. "Yellen is trying to nudge the expectations for a rate hike in March higher. This doesn't mean they will move in March, but the Fed wants to have the option to move," said Omer Esiner, chief market strategist at Commonwealth Foreign Exchange Inc.
"There's a nod to further tightening ahead and the risks of waiting too long, and there is a reference to the need at upcoming meetings to evaluate if the economy is evolving in a way that makes further hikes appropriate," said Avery Shenfeld, chief economist for CIBC Capital Markets in Toronto. "Note the use of the plural on 'meetings,' so there was no specific allusion to a March hike in the statement, and Yellen also emphasized that any hikes will be 'gradual.'" Ahead of the testimony, Richmond Fed President Jeffrey Lacker said the U.S. central bank will likely have to raise rates faster than financial markets currently expect given any new policies by the Trump administration, while uncertain, will force the central bank's hand. On the upside for gold, holdings of SPDR Gold Trust, the world's largest gold-backed exchange-traded fund, rose 0.49 percent to 840.87 tonnes on Monday. Gold has rallied nearly 10 percent since touching 10-month lows in December. In other precious metals, spot silver rose 1 percent to $17.97, having hit its highest since Nov. 11 above $18 earlier. Palladium gained 1 percent to $782.40 while platinum was up 0.6 percent at $1,001.20. "Platinum also saw noticeable ETF inflows of 8,900 ounces (Monday)," Commerzbank said in a note. February 14 (Reuters) Oil prices dipped on Wednesday over concerns that producer club OPEC would not be able to maintain its high compliance so far with output cuts aimed at reining in a global fuel supply overhang. Brent crude futures LCOc1 were trading at $55.80 per barrel at 0115 GMT, down 17 cents from their last close. U.S. West Texas Intermediate (WTI) crude futures CLc1, were down 20 cents at $53 per barrel. Yet overall, analysts said that oil markets remain well supplied despite the OPEC-led cuts, thanks in part due to a 6.5 percent rise in U.S. oil production since mid-2016 to 8.98 million bpd. Outside physical oil markets, a rising correlation between crude futures and the U.S.-dollar .DXY has caught market attention. Should a strong dollar and rising oil prices persist, traders say that would be a driver for higher inflation. ULAANBAATAR, Mongolia, February 14 (AP) — Mongolian lawmakers have told the government to revoke a private company's purchase of a stake in a major copper mine, prompting the president to warn they might scare away investors as the country tries to reverse an economic slump. Legislators approved a resolution Friday calling on Prime Minister Jargaltulgyn Erdenebat to revoke a Mongolian investor's $400 million purchase of a Russian state company's 49 percent stake in Erdenet Mining Corp. They want the government, which owns the rest of Erdenet, to take full control. Investor confidence has been shaken by previous disputes over the role of foreign mining companies and complaints too little of Mongolia's mineral wealth makes its way to the poor majority. Pressure to perk up the economy has mounted as weak global demand for Mongolia's minerals dragged down growth to a 1.6 percent contraction in the latest quarter. Mongolia's national debt stands at about $23 billion, or twice annual economic output, and a $580 million payment to foreign bondholders is due March 21. Mongolian leaders are deciding whether to pursue a potential emergency loan from the International Monetary Fund. Last week's vote followed a change of government in June elections and a parliamentary inquiry that concluded the real buyer was a Mongolian bank that violated lending rules by hiding how much money it put up. It was the first time parliament has called for the government to take over a company since the end of Soviet-style communist rule in the early 1990s, when Mongolia sold off state assets. Approval of the Erdenet sale was announced June 28 by then-Prime Minister Chimediin Saikhanbileg. But the next day, his Democratic Party lost control of parliament to the rival Mongolian People's Party in national elections. It was unclear whether Erdenebat was obliged to act on parliament's demand, but President Tsakhiagiin Elbegdorj, a Democratic Party member, warned the vote might hurt the economy. "The resolution could drive away foreign investors and entrepreneurs" and "further isolate Mongolia," Elbegdorj said in a statement. Still, Elbegdorj said authorities should root out the "hidden and illegal business operations" of Erdenet. Earlier, global miner Rio Tinto Ltd. delayed development of a gold and copper mine, Oyu Tolgoi, due to disagreements over revenue sharing and the foreign role in mining. After that dispute was settled, Rio Tinto announced last May it was ready to go ahead with a $5.3 billion expansion. Saikhanbileg said that showed Mongolia was "back to business." Erdenet, Mongolian for "Treasure," operates a mining complex about 150 miles (240 kilometers) northwest of the capital, Ulan Bator. Until last year's sale, it was one of Russia's biggest assets in Mongolia. Controversy over the sale was fueled by complaints a Mongolian bank, Trade Development Bank LLC, was the real buyer and violated lending rules by financing the acquisition. The purchase was led by a 28-year-old lawyer, Tsooj Purevtuvshin, owner of Mongolian Copper Corp. Purevtuvshin, also known by the nickname Tush, said MCC bought Erdenet using financing from a group of investors. However, a report by parliament concluded the money came from TDB, which put up $354 million, and a bank owned by a TDB shareholder, which put up $55 million. That violated rules that should have limited TDB to lending about $70 million, according to Jargalsaikhan Dambadarjaa, an economist and journalist. Parliament also found the central bank lent money to a company in Purevtuvshin's investment group without official approval. The central bank governor at the time was a former TDB board member. Purevtuvshin denied violating financial rules and said only about $75 million came from TDB. "We strongly reject these findings and action by parliament," he said in a phone interview. TDB's chairman and CEO, Orkhon Onon, also denied wrongdoing. In a written statement, he said his bank's role was limited to "partial financing" and investment advice. "All the allegations made against TDB by the parliamentary working group are misleading, baseless, politically motivated and deliberately fabricated," said Orkhon's statement. Dambadarjaa opposed the Erdenet sale but criticized parliament's latest action as a possible threat to property rights. "The government must protect both private and public property," he said. Ulaanbaatar, February 14 (MONTSAME) The Ministry of Finance and the Government Agency For Policy Coordination on State Property are jointly conducting investigation on Erdenet Mining Corporation's production, financial and economic activities by the end of 2016 in pursuance of orders issued by the Parliamentary Standing Committees on Economy and Justice. The investigation targets to examine the corporation's production, profits, financial situation, utilization of state property, spending on assets, debt state, results of purchase and contracts. A broader inspection team consisting of Bank of Mongolia, Finance Ministry, National Audition Department will probe the Erdenet Mining Corporation in near future to review and make conclusion regarding its financial violations and arguments. February 14 (Mongolian Economy) Mongolia is a country of young people. Young people can be seen everywhere in the city streets, and even in rural areas tending to their livestock. You do not need to look up statistics to get the idea that it is a nation of the young. Today, people are becoming even more the proud of the country's youthfulness. Sometimes it even seems as though politicians worship this fact. Cabinet ministers say that we are a young country whenever they get behind a podium, and MPs talk about it in front of the cameras. But! Perhaps this seemingly great feature should be looked at from another angle. What is the average life expectancy of Mongolians? What percentage of the population is composed of people 65 and above? People need to see the statistics and think about it. The National Statistical Office regularly publishes such statistics. Hence, is the proud statement "Mongolia is a country of young people" really just a euphemism for "Mongolia has a low life expectancy country"? We struggled to reach a population of three million, but the average life expectancy is unsatisfactory. According to 1989-2008 rates, Mongolian people aged 65 or above have been increasing by an average of 0.67 percent per year. It was 3-4 times lower increase than the 1995 World Health Organisation rate (2-3 percent increase per year). Such a slow rate of increase is a direct result of the high mortality rate of this age group in Mongolia. These are not random figures, but conclusions by experts. Therefore, we need to think carefully. It is time to heed the advice of experts instead of sugar-coating reality with platitudes on the young. According health sector experts, the life expectancy rate has not improved and has even declined in some ways. One important thing that they have raised alarm about is the average life expectancy of men, which has fallen to 64 years. Perhaps it is related to the carefree, or perhaps reckless, nature of Mongolian men. Mongolian men need to pay more attention to the health. It is not just a journalist saying this, but experts, doctors in particular. In contrast, it seems that women are much better at taking care of themselves as their average life expectancy has risen to 73 years, mean that women live nine more years than men on average. This gap is widening year by year. One of the many reasons is men's carefree nature as stated above. Secondly, Mongolian men love the drink. In Japan, elder people account for 26.7 percent of the population, and researchers explain that their high life expectancy is related to their lifestyle, but most people probably already know why the Japanese live long. Japanese people hold their health and diet in high regard. That is the culture. However, the traditional Mongolian lifestyle is bringing down the life expectancy of men. There is a Mongolian joke that men are the waste basket before the trash bin, because any food the mother or children do not want to eat goes to dad. Doctors point to such cultural tendencies, as the views such a joke represents are actually a big part of the reason for the deterioration of men's health. Another issue is that parents do not give enough attention to boys. Mongolian parents living in rural areas try to provide education and good food to their daughters, while the sons are left to tend to the livestock in the freezing cold. All the hard work is on the boys' shoulders, in their ripped and worn-out clothes. This treatment of boys instils the attitude of disregarding health from a young age, according to research. When you look at it that way, it is hard to deny its truths. Just take a look at the men around you. Are there any who willingly practice good hygiene and health? Rare, very rare. They will not clip their nails unless the woman nags them to do so. Perhaps women need to keep nagging until one day or another when men start to give a damn about their health. Hence, we need to thank the doctors who have been nagging us for years. Their ceaseless efforts are starting to reach the public. It sure would sound nice if people lauded that "Mongolia is a country of young people" if average life expectancy were a bit higher. Summary: Chairman of the General Election Commission Ch. Sodnomtseren and General Secretary Ts. Boldsaikhan held a press conference on the presidential election scheduled to take place on June 26. Mongolian citizens living abroad will be able to vote on June 10th and 11th. The budget for organizing the election stands at 14 billion MNT, and Ch. Sodnomtseren noted that preparations are underway to increase voter participation. The final candidates for the presidential election will be announced in May. Summary: MP A. Undraa, N. Amarzaya, Ts. Garamjav, Ya. Sodbaatar, O. Sodbileg, G. Temuulen, and J. Bat-Erdene have established a lobby group to support responsible mining. The lobby group will work to develop a legal framework for the use, closing, and restoration of mines, as well as the effective and responsible use of natural resources carried out by utilizing the latest technology. Summary: The Ministry of Mining and Heavy Industry and the Authority for Fair Competition and Consumer Protection (AFCCP) have urged Petrovis and Shunkhlai to lower their prices for gasoline. Four AFCCP working groups were established to research the recent retail price increases, and Head of the AFCCP B. Lkhagva stated, "The companies should have discussed the price increase with the Vice Minister of Mining and Heavy Industry, but some companies increased prices without notice." The government typically lowers the excise tax for gasoline if global gasoline prices increase, and the government recently lowered excise tax by 2-3 times in order to stabilize gasoline prices for consumers. Summary: State-owned Erdenes Tavan Tolgoi (ETT) exported a quarter of Mongolia's coking coal exports (equaling 7.65 million tons), but according to estimates, Erdenes Tavan Tolgoi spends 136 MNT for every 100 MNT earned. Over the past six years, ETT has exported 24.2 million tons of high quality coking coal and accrued 453 billion MNT in losses. Twenty percent of ETT's stocks are owned by Mongolian citizens, and CEO of Ard Financial Group Ch. Gankhuyag noted that the rights of the company's minority stockholders have been severely violated. ETT has accrued 822 billion MNT in losses since it began operations, and analysts note that around 12% of the company's debt is owed to Chalco. Analyst L. Naranbaatar noted that in comparing ETT to small mining companies, ETT's mining expenses are 51.3% higher than smaller operations, but when comparing ETT to Energy Resources, ETT's mining expenses are 106% higher. Summary: Member of Parliament and Minister of Foreign Affairs Ts. Munkh-Orgil is visiting Russia at the invitation of Russian Minister of Foreign Affairs Sergei Lavrov. The two ministers discussed relations between the two countries and international current affairs. Minister Lavrov noted that Russia values its relationship with Mongolia, and that economic, cultural, and diplomatic ties between the two countries are developing well. Ts. Munkh-Orgil stated that the visit underway is of critical importance to developing trade, economic partnership, and diplomatic relations between the two countries. The sides discussed cooperation in the Asia-Pacific region and with the UN, the Shanghai Cooperation Organization, and Eurasian Economic Commission. Mongolian Business Database (MBD) is starting to register the Mongolian business delegates to "Accounting best practices" theme targeted business program by Saki partners Australia www.sakipartners.com.au and Dr.Nigel Finch, Honorary Consul-General of Mongolia in Sydney. The business program includes a half day special training seminar and Australian accounting and financial company visits. The Australian Partner Dr. Finch is a Managing Director of Saki Partners, Chartered Accountant, a Chartered Tax Adviser and a Fellow of CPA. He is a member of the Representative Council of CPA Australia, a director of the Australia Mongolia Business Council and a director of several companies listed on the Australian Securities Exchange. He recently served as a Dean of Accounting Department of Sydney University. For more information please visit the following link http://www.mongolianbusinessdatabase.com/base/eventsdetails?id=17 and register at contact@mongolianbusinessdatabase.com or by tel: 77109911 and 98994787. The registration will be closed by February 22, 2017. Since 2007, the Business Council of Mongolia (BCM) has grown from 35 to 245 members with a total of approximately 40,000 employees. Today, BCM represents largest member of international investors and has 8 working groups with over 400 experts and leaders. We have become a leading business representative organization among Mongolia's 1,400 NGOs. BCM is the premier business organization in Mongolia that advocates for a stable, fair, and transparent business environment in Mongolia. We seek to recruit Research Analyst, who will ensure members receive highly relevant and highly useful insight in most timely manner. The Research Analyst will be mainly responsible for researching key economic and market trends and sharing insights with our members. Qualified candidates will need to be fluent in English and in Mongolian and have analytical experience and mindset. (FreightNet) The enquirer requires a shipping rate for Phosphoric acid (Chemical-DG-Mild steel corrosion inhibitor to be despatched by Surface and arrive no later than 30/03/2017. The consignment is departing from Australia and arriving at Mongolia. Full details of this shipping rate request can be found below. Only Premium members with an office in Australia or Mongolia can respond to this rate request. February 14 (DNA) Japan, Czech Republic, Mongolia and Tunisia are participating as partner countries in the two-day "Momentum Jharkhand: Global Investors Summit" beginning on February 16, state Industry Secretary Sunil Kumar Burnwal said today. The partner countries session is scheduled to be held on February 16 afternoon. Stating that the Summit would change the image of Jharkhand, Burnwal said its aim is to invite investors and apprise them of the state. He said the growth rate of Jharkhand is 11 per cent and, possessing 40 per cent of the country's minerals, it has potential to become a developed state. He said there is a land bank of 2.1 lakh acre and investors would not have any difficulty in setting up their business. Earlier, investors used to be attracted by mineral resources but now investors would be shown other areas of interest, he said. Cricket icon M S Dhoni is Brand Ambassador for the Summit, which will give benefit to the state, he said. According to an official document, investors would get a dedicated 'single window system' for all project requirements, overall support to expedite project process, simplified steps to deal with government and other business partners to streamline path to a secure investment, policy and regulatory assistance. Other two points are assistance in accessing the state s skilled workforce, ensuring the investors are connected to professionals, who can deliver desired results and assistance in linking the investors to new technologies, services, skills or processes which may add value to the organization. Ulaanbaatar, February 14 (MONTSAME) Until February 23, the Emergency Department of Ulaanbaatar City is holding examination on religious organizations, monasteries and temples regarding the safeguard of fire and other disasters in connection with approaching Lunar New Year-National Holiday. Observance of laws on Disaster protection and Fire safety, relevant regulations, ordinance and standards will be examined and advice and recommendations will be given with a view to safeguard people and property. As many Buddhist monasteries have wooden buildings and hold religious rituals using fire during the holiday, the Emergency Department raised the concern for safety. February 14 (news.mn) Mongolian Foreign Minister Ts.Munkh-Orgil is currently visiting Moscow on a two-day visit at the invitation of his Russian counterpart, Sergey Lavrov. During the visit (13-14th of February), Mr Munkh-Orgil concluded an agreement with Russian Foreign Minister Lavrov on a cooperation agenda in trade, the economy and investment between the two countries. At the press briefing following the talks, Mr Sergey Lavrov stated: "We value that the bilateral relations between Mongolia and Russia are founded on long-standing economic, humanitarian and historical ties, and our common position on regional and global issues as good neighbours. The aspiration of the leaders of the two countries to achieve maximum effectiveness of the strategic partnership potentials have been reflected in the 2009 Declaration. Based on this Declaration, the Medium-Term Programme, incorporating the major objectives on developing cooperation in politics, trade-economy, investment, culture, education and global affairs, was signed in 2016 in Ulaanbaatar. The successful implementation of the programme gives an impetus to activate ties on all levels." The foreign ministers also discussed the much needed strengthening of ties with economic content, promoting the development of cooperation in transport, agriculture and energy, and activating trade and ties between the border regions of Mongolia and Russia. The two sides have agreed to regulate the execution of certain measures in order to realise the provisions of the Medium-Term Programme, and to upgrade bilateral relations by jointly implementing projects reflected in the Tripartite Programme on Establishing the Mongolia-Russia-China Economic Corridor. Ulaanbaatar, February 14 (MONTSAME) On February 14, on the sidelines of his working visit to the Russian Federation, Minister of Foreign Affairs Ts.Munkh-Orgil met with Deputy Minister of Economic Development of Russia A.V.Gruzdev to discuss bilateral trade, economic, investment and financial ties as well as issues concerning regional and international cooperation. During the meeting, the sides reaffirmed their mutual interest of collaboration to increase bilateral trade turnover and investment and balance trade deficit, eliminate tariff and non-tariff barriers, draw more Russian investment to infrastructure and energy sectors of Mongolia by co-implementing joint projects. In addition, the sides agreed to cooperate towards the development of favorable legal environment and promotion of regional cooperation, in particular, cross-border cooperation between Mongolia and Russia. Within the framework of the target to eliminate tariff and non-tariff trade barriers, FM Ts.Munkh-Orgil asked for Russia's assistance in forming a joint research working group on establishing a free trade agreement with the Eurasian Economic Commission. Moreover, the dignitaries agreed to study feasibilities to form a council responsible for establishing Investment Projecting Centre in Ulaanbaatar and making policy adjustments on trilateral cooperation within the framework of the activation of the implementation of the tripartite program on Establishing Mongolia-Russia-China Economic Corridor. In this regard, a trilateral meeting of Mongolia, China and Russia was arranged to take place in Ulaanbaatar this March, as consulted with the Chinese side. Deputy Minister A.Gruzdev noted that a large delegation from Mongolia is invited to the Russia-China EXPO, which will held in Harbin, China in June with an aim of deepening the economic ties of three countries. Ulaanbaatar, February 14 (MONTSAME) On February 14, Deputy Minister of Justice and Internal affairs B.Enkhbayar met with Deputy Chief of Mission at the US Embassy in Ulaanbaatar Manuel Micaller and two other officials in charge of regional political affairs and security. The Deputy Minister noted his satisfaction with the active relations and cooperation of the two countries in the justice sector. They exchanged views on issues of bilateral ties, including involving personnel under training in the field of domestic violence, conducting criminology tests on such crime as well as intellectual property protection and prevention from crimes. The two sides agreed to collaborate by training law enforcement officers in the International Law enforcement academy. The US delegates expressed their appreciation to Mongolia for developing a program to combat human trafficking and expressed its readiness to support it. Ulaanbaatar, February 14 (MONTSAME) On February 14, General Director and Commissioner General of the Independent Authority Against Corruption Kh.Enkhjargal received Ambassador Extraordinary and Plenipotentiary of Canada to Mongolia Ed Jager. The Commissioner General extended his gratitude for the successful implementation of the ongoing Asia Foundation projects funded by the Government of Canada. Commissioner General Kh.Enkhjargal briefed on the functions, rights and responsibilities of the IAAC and said that the agency has been working to enable public monitoring and involvement in all directions in order to effectively implement the National Program to Combat Corruption, which is adopted by the parliament last year. Ambassador Ed Jager noted that Mongolia-Canada relations have been intensifying in recent years and applauded the successful host of the National Forum on Anti-Corruption. He then expressed his willingness to broaden collaboration with IAAC. The IAAC director and the Ambassador discussed the development of bilateral ties between Mongolia and Canada and ways to support anti-corruption activities in Mongolia. Ulaanbaatar, February 14 (MONTSAME) On February 1, Parliamentary Standing committee on Security and Foreign Policy resolved to close some Mongolian diplomatic missions abroad within the first half of this year, until the economic conditions of Mongolia improve. The missions to be shut down temporarily are Embassies of Mongolia in Indonesia and Brazil and Consulates General in Osaka, Japan and Hailar, China. Regarding the decision, the Ministry of Foreign Affairs of Mongolia issued a press release to note that the decision will not affect the political ties and other relations Mongolia maintains with the countries named. It further says the diplomatic missions will be re-opened after the current budget and economic conditions improve. The Ministry of Foreign Affairs is implementing measures on closing the embassies and consulates in accordance with international principles and relevant regulations. Ulaanbaatar, February 14 (MONTSAME) "Press Hour" monthly conference of the Ministry of Foreign Affairs took place on February 14. State Secretary of the Ministry D.Davaasuren introduced the ministry's plans for 2017 regarding the foreign trade and economic relations and gave information on the foreign minister's visit to Russia. According to D.Davaasuren, a total of 32 projects are included in the Program on the Establishment of the Economic Corridor of Mongolia, Russia and China. Within the framework of the program, proposals are sent to the two neighboring countries to establish "Investment Projecting Center" in Mongolia. Also, an expert-level meeting is expected to take place in Ulaanbaatar in March to talk issues concerning the program. The MFA is focusing on renewing the "national program to support exports" and advancing the implementation of "Mongol Export" program and the establishment of a free-trade zone in Zamiin-Uud and Ereen cross-border port areas. Also, the Ministry informed about its plans for this year, which include joining Asia-Pacific Trade Agreement to increase and enable the exports of domestic products to the neighboring countries' markets, improving the legal environment of foreign trade, negotiating free-trade agreements with third neighbors and economic unions, attending ASEM Economic Ministers' meeting, promoting public-private partnerships and conducting effective economic "advertisements". The State Secretary also gave information on Mongolia's relations with its third neighbors and major trade partners. For instance, Mongolia and Japan signed Economic Partnership Agreement in June 2016. In this connection, 13 subcommittees were re-established to create a permanent consultation mechanism. On that note, the MFA seeks to sign free-trade agreement with the Republic of Korea. Within the framework, Mongolia and South Korea signed the terms of reference of a joint research team on establishing Economic Partnership Agreement in October 2016 and organized the first meeting of the joint group in December 2016. In addition, the MFA has agreed with the Eurasian Economic Union to commence joint research on free-trade agreement with the union in order to reduce and remove tariffs and non-tariff barriers for Mongolia's export products to Russia, Belarus, Kazakhstan, Kyrgyzstan and Armenia. During the press conference, the State Secretary of Foreign Ministry reported that Foreign Minister Ts.Munkh-Orgil has been invited by Minister for Foreign Affairs of the People's Republic of China, Wang Yi. The Foreign Minister of Mongolia may visit to China on February 19-20. February 14 (news.mn) Ahead of the traditional 'Tsagaan Sar' (White Moon) festival, the Mongolian Embassy in the Czech Republic in cooperation with the "Step in Mongolia" travel company organised a cultural event in Prague on 13th of February. The aims were to promote the traditions and history of Mongolia. During the cultural event, Mongolian artists performed "Khuumei", or throat singing, and the Morin Khuur, or horse-headed fiddle, provided music. The visitors were plied with traditional Tsagaan Sar food. In addition, an exhibition of powerful photos taken by French photographer Remi Chapeaublanc during his solo trip to Mongolia where exhibited. The photo exhibition also showed the "Mongolian Felt Festival" which takes place annually in Uvurkhangai Province. February 13 (World Radio Day) Mongolia is celebrating the World Radio Day for the first time this year. Communications Regulatory Commission, Mongolia has initiated the World Radio Day Celebration in collaboration with all Radio Broadcasters and related NGOs in the sector and organized "Radio Is You" seminar for all radio broadcasters in Ulaanbaatar, Mongolia. As we are Regulator for the ICT sector including Broadcasting, we highly appreciate Mongolian National Commission for UNESCO for recommendations urging regulator and radio broadcasters to celebrate the World Radio Day in Mongolia. In the Seminar, interesting presentations on various important issues under the theme of World Radio Day were made by related NGOs such as Glob International NGO, Media Council of Mongolia and Ethics Committee of Radio TV Broadcasting and the related issues were discussed during the seminar. As well as the following presentations were made by the Communications Regulatory Commission and the related issues were discussed during the seminar. The seminar on "Radio is You" was successfully organized during the World Radio Day in Mongolia. We do hope that the Event will bring wider participation from all the radio broadcasters throughout the country and will be more efficient for the sector and the audiences next year. February 14 (University of Arkansas) Mongolia was not what Abby Graupner had in mind when she joined the Peace Corps after graduating from the University of Arkansas in 2013. Though Graupner indicated on her Peace Corps application she was willing to go anywhere, she had always imagined herself in hot, humid environments. Instead, she received a 27-month assignment in Mongolia, a country with winters that can average 40 degrees below zero and last eight months. "I wanted the universe to direct me where to go," Graupner said. "Even though I would have never chosen Mongolia, it was a really good experience to explore a country I never even thought about." The U of A alumna was placed in Jargalant, Mongolia, as a community development officer and English teacher. She worked to develop women empowerment projects in the community and partnered with local teachers to implement interactive teaching methodologies. She said working with more than 500 students was not easy, but she found her reward in the support she received from the community and the growth she observed in many of her students. "I know not all 500 students learned English, but I saw an incredible increase in skill from several of the students," she said. "Beyond English, there are girls there now who are pursuing real careers because they were exposed to women who are pursuing their dreams. I may not have had an impact on every student there, but if I made a difference in even a few people's lives, that's a pretty cool experience to have." Graupner, who returned from Mongolia in November, is already on another Peace Corps assignment. She began a 10-month position as a response volunteer in Guatemala earlier this month. While there, she will be working with a team of Guatemalan agricultural extension agents to teach local farmers about sustainable farming practices and food security initiatives. Prior to joining the Peace Corps, the native of West Fork, Arkansas, participated in multiple study abroad programs as a U of A student. She said her experiences as a student abroad and her experiences as a volunteer in the Peace Corps have helped mold her into the person she is today. She hopes her experiences will inspire other U of A students to push their boundaries and explore education abroad opportunities. "I literally grew up on a cow field, and now I've been to 26 countries," she said. "I encourage students to not let what they think are their restrictions hold them back. We all have the same amount of potential, but it's the amount of work we put in and the paths we pursue that allow us to reach it." Graupner, who earned bachelor's degrees in international business economics and Spanish, plans to pursue graduate education after concluding her experience with the Peace Corps. Students interested in learning more about Peace Corps opportunities can visit with a Peace Corps representative at the U of A Career Fair from noon to 4 p.m. Thursday, Feb. 16, in the Arkansas Union Verizon Ballroom. Students interested in learning more about study abroad opportunities should contact the Office of Study Abroad and International Exchange. February 14 (Lifebox Foundation) Lifebox is working with the Mongolian Society of Anesthesiologists to support safer surgical care across this vast country. With the help of our partners at the Australian Society of Anaesthetists, we're providing essential equipment and training to hospital teams. Want to learn more about surgery in Mongolia? Catch award-winning documentary 'The Checklist Effect' at a festival near you, or visit lifebox.org/checklisteffect for more information. A device common in Western hospitals could save millions of lives if integrated into operating rooms around the world. February 14 (The Atlantic) Gundegmaa Tumurbaatar glimpsed her son only for an instant as he was carried into the aging Soviet-built hospital where she works. It was one of the first fine days after the grueling Mongolian winter, and she had left Gunbileg, aged 3, and his older brother playing outside, telling them to be careful. Now, he was moaning in pain and covered from head to toe in filth and blood. A passer-by had brought Gunbileg to the hospital after seeing the two boys trying to jump over an open manhole above a sewer—watching in horror as the younger boy had fallen into the jagged pit on his abdomen. By the time Gundegmaa saw him, he was in shock, his belly frighteningly distended, an internal hemorrhage putting him at imminent risk of cardiac arrest. She learned the details of his injuries later: His spleen, the delicate fist-sized organ that sits just below the ribs and which acts as a blood filter as part of the immune system, was ruptured. "His tummy must have caught on something sharp inside the hole in the ground," she says. But she didn't need to be told how serious this was. As soon as she saw him, Gundegmaa, a midwife at the hospital, knew that this was a potentially fatal internal injury. Suddenly, the life she and her husband, Batsaikhan Batzorig, had created with such effort looked about to turn to dust. Gundegmaa and Batsaikhan were both born in the small town of Ondorkhaan in Khentii Province—one of the coldest spots on the Mongolian Steppe and 330 km of often deeply pitted road from the capital city, Ulaanbaatar. They had married soon after leaving school, and their first child was born 12 years ago. Back then it was a grim time in Mongolia, which was still in the grip of the desperate poverty that hit when 70 years of Soviet influence ended in the early 1990s. Russian forces had withdrawn from the country, taking with them the loans that had kept Mongolia afloat. It was fortunate that there were, and still are, hundreds of thousands of nomads in the country, around a quarter of the population. With their livestock—25 million cows, horses, sheep, and goats—at least people didn't go hungry. But the couple worked hard to build a life together. First, Gundegmaa enrolled at the nursing school in Ulaanbaatar that had been established under the Soviet "Semashko" health-care system. Her husband remained at home with their baby—and then three years later they swapped roles round, so that by 2010 both had jobs with the local hospital. He was a senior nurse; she was a midwife. Their hometown was also on a roll, it being the capital of the province where the 12th-century Mongol warrior Chinggis Khan is thought to have been born. During the Soviet era, Mongolians were forbidden even to utter the name of the man they now regard as their national hero. But in 2013, the town known as Ondorkhaan was grandly renamed Chinggis City by an act of parliament. Gundegmaa and her family could visit a new museum featuring a replica of the great leader's ger, the traditional tent, made of white felt, of this nomadic people. The town's playgrounds, as throughout Mongolia, have figures of children (of both sexes) engaged in the "three manly sports"—horse riding, wrestling, and archery—that Chinggis Khan considered essential daily activities for his warriors. Just two weeks before Gunbileg's accident, the family had moved into their first proper home, a flat in one of the new high-rise blocks. On duty the day of the accident was Mendbayar Lkhamsuren, an experienced surgeon with more than 4,200 operations under his belt since he started working at the hospital in 2000—including, crucially, four previous cases involving a ruptured spleen. Through his training in safe surgery, Mendbayar has a genuine humility about the work he undertakes. "When I wake up in the morning, I reflect on the fact that I'm only human and that I'm just as capable of making mistakes as anyone else," he tells me. Mendbayar and his surgical team worked fast to remove the spleen and stem the bleeding, and Gunbileg survived. Now aged 4, he needs to have all his jabs: without his spleen, he's at increased risk of infectious diseases such as pneumonia and flu. But he is brimming with health and optimism, and has a passionate attachment to "my doctor Mende." When I meet him in the antenatal department of the hospital, keeping close to his mother, he lifts up his long white jacket, just like his hero's, which covers a prominent scar on his tummy. A major contributory factor to his survival is a very bright idea that is changing emergency health care for people living in low- and middle-income countries. As Gunbileg was carried into the emergency room in May last year, a nurse placed on his finger a small peg-like device attached by a wire to a battered-looking yellow monitor the size of a mobile phone. "Don't be taken in by appearances," the hospital's anesthetist says as she sees me squinting to inspect it during my visit last October. "That device has been used every single day for the past four years. It's saved hundreds of lives. And it's still going strong." The device is a pulse oximeter. Invented by Japanese scientists in the early 1970s, this non-invasive device, which attaches via a clip to the top of the patient's finger, accurately measures blood oxygen saturation—the percentage of hemoglobin in the blood that is oxygenated—and displays the figure on the monitor along with the patient's pulse rate. The device's audible beep reassures the team that all is well, with the pitch dropping if there's a problem, allowing the anesthetist to "hear" any changes in oxygen-saturation levels. In high-income countries today, pulse oximeters are part of the furniture in recovery rooms, ambulances, accident and emergency departments and many hospital wards—wherever patients' symptoms are serious and unpredictable. Its most important role, however, remains where it first began: in the operating theater. "Oximetry is a key component in the revolution in anesthesia care that has brought down the death rate from anesthesia by over 95 percent in a generation," says Atul Gawande, the Boston surgeon, bestselling author, and New Yorker magazine writer. In the early 1970s, one in 10,000 people per anesthetic administered died while under the gas in the U.S.: Thousands of people were dying every year. By the 1990s, when pulse oximetry was routinely used, that was closer to the current figure of less than one in 100,000. Yet the benefits of pulse oximetry have failed to spread throughout the world. More than 77,000 operating theaters in low- and middle-income countries were carrying out surgery without a pulse oximeter according to a survey carried out in 2010, two decades after pulse oximetry became routine in affluent countries. Meanwhile, the rate of surgery in these countries has been increasing. The annual number of operations globally increased from 234 million in 2004 to an estimated 359 million in 2012 according to the World Health Organization (WHO), which reported that the 38 percent increase in surgical volume is occurring almost exclusively in low- and very-low-resource countries. And rightly so, says Gawande. "Of course this rate of surgery is needed," he says. "More people die every year from conditions that can be effectively treated with surgery than from HIV, malaria, and tuberculosis combined. And surgery is essential for reducing maternal mortality, and deaths from road traffic accidents." The problem is that while the rate of surgery is increasing, so is the rate of those damaged by surgery. Research published in the Lancet in 2009 shows that more than 7 million people are left dead or disabled from complications due to unsafe surgery every year—with the risk of complications and deaths from essential operations up to 1,000 times higher in low-resource settings. All but the newest recruits to the Mongolian anesthesia community understand the background to these statistics. Unurzaya Lkhagvajav, a former president of the Mongolian Society of Anesthesiologists, qualified as an anesthetist in 1980 and reckons she has provided anesthesia for 30,000 operations. The equipment she had available to keep a patient safe during most of these operations was a stethoscope, a watch with a second hand, and a pencil. "The only way to know if a patient's blood was oxygenated was to take the patient's pulse throughout the operation and check the color of the fingernails: If they were pink, the patient was in good health," she recalls. "It was exhausting work. And once the operation was over, the need to monitor blood oxygen levels is just as important. The only way to check for post-surgical complications was to sit with the patient all night. And of course that wasn't always possible, not when you had a long shift the next day." In 2008 Gawande, at the request of the WHO, led a group of expert nurses, anesthetists, and surgeons to create the Surgical Safety Checklist. Essentially, it is a communications framework designed to eliminate human error in the operating theatre in the same way as the aviation industry has made flying safe for passengers. But alongside behavioral change to ensure effective teamwork and, for instance, that appropriate bloods and equipment are easily accessible and antibiotics administered, there's a single piece of kit, the pulse oximeter, that is mandated by the checklist. Without it, the WHO decided, surgery is simply unsafe. In 2011, with the support of prominent medical institutions, Gawande helped to found the charity Lifebox to make safe surgery a reality throughout the world. "We started by doing work that reduced the cost of robust, hospital-grade pulse oximeters for low-income countries by over 80 percent to just $250," he explains. The Lifebox oximeter can withstand extreme heat and cold and the battery is functional for at least 12 hours. Crucially, it is also tough, and can be dropped from table height without breaking. "It's not going to break down soon after arrival, a serious problem with medical equipment in low-resource countries," says Gawande. Studies suggest that the WHO checklist, when used correctly with pulse oximetry, reduces complications and mortality by 30 percent. By providing pulse oximeters in low-resource settings, Lifebox estimates that it has contributed to making surgery safer for 10 million patients. Through donations, Lifebox has distributed nearly 15,000 oximeters to hospitals in settings where even the cheapest and most fragile oximeter is unaffordable. But it's much more than this, Gawande says. "If all we were doing was parachuting in a bunch of pulse oximeters, we wouldn't have such a tremendous impact." Instead, through a volunteer network of anesthetists from high-income countries, Lifebox has supplied thousands of anesthesia providers in low-income countries with safety skills training. "Once you introduce the device and safety training into the riskiest part of the hospital system, you begin to build confidence that there are professional values at work aimed at generating better, safer care," Gawande explains. "It gives clinicians confidence that they can take on more difficult cases. And people begin to believe that turning to hospitals when you are in desperate trouble is safe, that these are places you want to go." Ganbold Lundeg was surprised when he first read the Bible—and not pleasantly. It was 1993, a low point in Mongolian history, when post-Soviet medicine, like the country itself, was floundering. Ganbold, a lecturer in anesthesia at the Health Sciences University of Mongolia, wasn't alone in wondering whether the Bible, much promoted by a visiting surgeon and missionary from Arkansas, USA, Albert "Buck" H. Rusher, might offer an answer. So he decided to learn English in order to read it. The American's Bible classes were a hit with the Mongolian medical community. "Some doctors were converted to Christianity without reading the Bible," recalls Ganbold. "I wanted to read it first." He enrolled at an international school, attending the one English-language course in the whole of Mongolia at the time. "I'd heard so much about the Bible," he recalls. But the text, particularly the Old Testament, was unimpressive, "just like the fairy stories we heard as children." Yet he has never regarded as wasted the time he devoted to reading how Moses led his people through the Red Sea. Learning English gave him access to English-language medical journals, to which he was able to subscribe with the support of the missionary. "Even in the 1990s, these journals were regarded as subversive—they always arrived opened. I once had a visit from a member of the KGB who wanted to know why I was receiving them." Most importantly, he says, speaking English enabled him to make a personal connection that has undoubtedly helped to save hundreds, perhaps thousands of lives. In 1999, a Melbourne-based anesthesiologist, David Pescod, arrived in Ulaanbaatar to attend a medical conference. On that first visit, Pescod survived on mutton fat and vodka and spent two weeks listening to lectures in Mongolian interspersed with electricity cuts, all in –20ºC temperatures. The only other fluent English speaker present was Ganbold, who asked Pescod to return to deliver a lecture the following year. Pescod kept going back, forging links there together with a group of Australian colleagues, and what he learned about anesthetic practices in Mongolia surprised him. Mongolian surgical training and practice, he realised, were based on outdated, frankly dangerous 40-year-old Russian texts, with patients being given inappropriate anesthetic drugs and at insufficient doses. Pescod settled down to write a series of anesthesia textbooks designed specifically for Mongolian hospitals. In 2004, Ganbold's department, supported by the Australian team, started to implement the WHO's Emergency and Essential Surgical Care program, aimed at strengthening surgical services outside the capital city. "Many people think that surgery is something very special that cannot be delivered in a developing country or in a rural area," he says. "But when we build up safe conditions, educate people, and train them appropriately, then doctors and nurses can deliver safe surgery in a very small hospital anywhere in Mongolia." The recent safe surgery developments have built on this innovation. In 2011, the WHO Surgical Safety Checklist was made mandatory by the Mongolian health department. By 2012, funding from Australian and New Zealand anesthetists had paid for 116 Lifebox pulse oximeters: 64 in Ulaanbaatar, three in Chinggis City and the others distributed throughout the country. The oximeters themselves have been physically delivered by Lifebox, which also provides teaching materials for a one-day course on pulse oximetry that is now incorporated into a week of training on safe anesthesia that Pescod and his team continue to provide each year in Ulaanbaatar and throughout Mongolia. Lifebox pulse oximeters have been handed out to surgical teams at inter-soumhospitals, the large district hospitals such as the one in Chinggis City, as well as at smaller soum (township) hospitals, enabling local staff to respond to emergencies. At one level, it means that around 200 people a year with acute appendicitis are treated in Khentii Province instead of having to travel to Ulaanbaatar—the only location able to carry out appendectomies until four years ago. At the other extreme, emergency patients like Gunbileg receive urgent life-saving surgery. In January 2014, Ganbold became one of 25 clinical experts advising the Lancet Commission on Global Surgery—"the proudest achievement in my professional career"—with its aspiration to make safe surgery and anesthesia a human right available to all. Mongolia is now cited by the Lancet Commission as a potential model in promoting safe surgery and anesthesia for other medium-sized countries such as Myanmar and Laos, and even for India and China. Ganbold's great ambition is to open 20 hospitals with functioning operating theatres by 2020, by building up services in strategically located provincial clinics. If that means going cap in hand to wealthy countries and organizations, that's what he does. In Ulaanbaatar, we visit the UK ambassador to Mongolia, and Ganbold explains to her how the UK government could provide assistance with the minimum of funding. The UK firm Diamedica has pioneered the production of basic anesthesia machines that can be used virtually anywhere without electricity or even medical gases. Ganbold urges the ambassador to consider funding such machines for hospitals in remote Mongolia. She agrees to consider the idea. It's this persistence in seeking out and achieving the best that keeps Pescod coming back to Mongolia, he says. "Unlike other countries where I have lectured, eventually everything we bring to Mongolian anesthetists has been engaged and usually improved," he tells me. Bilguun Unurbileg, a senior lecturer in anesthesiology at the Health Sciences University of Mongolia and Ganbold's number two, says that's down to their nomadic ancestry. "Mongolians are hard-wired to reach out for new ideas. That's the result of centuries of living in the middle of nowhere, entirely reliant on yourself to care for your family. It's how we survive." Two thousand miles south of Ulaanbaatar, Assam in north-east India has twice the country's already high average maternal mortality rate: There are around 300 deaths per 100,000 pregnancies in Assam, compared with 174 in India as a whole and just nine in the UK. Three-quarters of these deaths occur among the 800,000-strong female workforce employed in Assam's tea gardens, where the high number of perinatal emergencies is the result of the harsh conditions of the working day. Even when women and their babies do get successful surgery in the nearest properly equipped hospital, post-operative care remains hazardous, partly because of the lack of pulse oximetry in recovery wards. "Health care for mothers working in tea gardens is pathetic," says Surajit Giri, a consultant anesthetist and critical care physician based at Demow Community Health Centre near Sivasagar, northern Assam. He is employed by the Indian government as part of its recently established National Rural Health Mission. But he's well aware of the deficiencies of the service. Demow is the only clinic providing care for seven tea gardens—and has only one operating theatre, with basic obstetric intensive care facilities. Last October, Giri helped to organize (and attended) a Train the Trainers workshop in Dibrugarh, organized by Lifebox, focusing on the benefits of pulse oximetry in post-operative care—an area local practitioners had identified as being one where they most needed support. UK consultant anesthetist Neeraj Bhardwaj talked 68 local anesthetists through a one-day Safer Anesthesia workshop. And at the end of the day, each practitioner was able to go back to work with their own new Lifebox pulse oximeter. The day after receiving the Lifebox oximeter, Giri made it mandatory for nurses at the health centre to monitor oxygen saturation levels in newborn babies, using the neonatal probe that comes with the adult oximeter for an extra $25. Already, he says, health care is safer. "That day, a baby was delivered that was shown by the probe to have just 58 percent oxygen saturation. The nurse immediately shouted for my help to resuscitate the baby, which I rushed to do—and it soon started crying healthily, maintaining oxygen concentration without assistance. Without the oximeter, that would not have happened. If five minutes had gone by before we took action, the baby would probably have survived, but with a disabling brain injury." The Dibrugarh course is the first event of a three-year initiative funded by the Stavros Niarchos Foundation that will eventually hand out 675 Lifebox pulse oximeters, with appropriate training, initially in three regions of India: Bihar, Odisha and Assam. It's the start of a journey to transform surgery in a country where currently 7,000 out of 155,000 operating theatres lack pulse oximetry. "Of course Lifebox pulse oximeters increase the safety of patients," says Giri. "But they also increase the security and confidence of anesthetists to join rural services, which they haven't done before because of lack of technology and poor infrastructure." One woman was 38 weeks pregnant when, lifting a heavy load while setting up camp in her felt-walled ger, she felt a sudden sharp pain in her abdomen. It was September 2015 and she knew straight away that her baby was at risk. The nomad family's ger was pitched in Khovd Province in western Mongolia. It's a natural paradise: a vast area of snow-covered peaks, rocky deserts, and salt lakes that is an adventure playground for tourists in the summer and a favored location for Mongolia's nomads to graze their herds of sheep, goats, and yaks. The woman used her mobile phone to summon the rural soum doctor from a small surgery a 20-kilometer, off-road drive away. He examined her, and confirmed that she had suffered a placental abruption, the pressure from the load she was carrying almost certainly causing a swathe of blood vessels that feed the fetus to detach from the wall of the uterus. "The rural doctor reported that the fetus was distressed and that it was out of the question for the mother to travel to us," recalls Nansalmaa, an obstetrician based in the main hospital in the city of Khovd. So the obstetric team, Nansalmaa, an anesthetist and a neonatologist went to the woman's ger, together with the basic equipment needed to carry out an emergency caesarean section, including an oxygen concentrator and suction machine, an operating lamp, a Honda electricity generator and, perhaps most importantly, a pulse oximeter. Within hours of an incident that until recently would have consigned the woman and her baby to becoming yet another obstetric fatality, both mother and baby survived thanks to safe spinal anesthesia followed by a caesarean section. Ger surgery is rare. But when necessary, it happens without fuss. For nomadic patients, that instils confidence: not just in the health-care system, but also in their chosen traditional lifestyle. That's what I discover when I call on Tumurdavaa Gursed in the ger that was the location for her emergency surgery eight years ago, when she was close to death due to a ruptured ectopic pregnancy. She too was unable to travel, and would have died had the emergency surgical team not already been in operation and ready to travel through the night to carry out the emergency operation—albeit without a pulse oximeter—at first dawn. I sit on the low bench used for the operation, reflecting on the commitment of the team back then—carrying out a two-hour operation in a roasting hot ger, the anesthetist bent almost double throughout to monitor his patient. Tumurdavaa, serving boiled horse with blood pudding and potatoes along with fresh cream and biscuits, is silent as we eat. I take it for shyness at first, but then realise it's simply a lack of interest in small talk. When I ask her about her brush with death, she talks at length, eloquent in paying tribute not only to the medical team but also to the impact of the policy of safe surgery on nomadic life. "I'm so joyful and reassured," she tells me, "that I can continue living blissfully beside my animals." February 13 (World Bank) Small grants helped a school in Mongolia put together a project on Electronics, where students assembled electric cars and learned about physics, mathematics and electricity. The experience sparked an interest and helped them build skills and gain knowledge that can help them in the future. February 13 (World Bank) Reforms in Education sponsored by the World Bank and the International Development Association are helping primary and secondary school students improve their skills in their native language, mathematics and environmental sciences through music, writing, acting and playing chess. Ulaanbaatar, February 13 (MONTSAME) Within the framework of an international BIRDS project, three Mongolian students at the Kyushu Institute of Technology finalized "Mazaalai" the first Mongolian miniature sized satellite on January 1. The Joint Global Multi-Nation BIRDS Satellite project - acronym as "BIRDS project" - is a cross-border interdisciplinary satellite project, composed of the deans of universities, researchers, professors and graduate and postgraduate students working at the Kyushu Institute of Technology (KIT) in Fukuoka Prefecture of Japan. The project is for non-space faring countries supported by Japan and is participated by countries such as Mongolia, Ghana, Nigeria and Bangladesh. Three Mongolian students pursuing a doctorate degree at the Kyushu Institute of Technology, D.Erdenebaatar, D.Amartuvshin and T.Turtogtokh are in the team to build the first Mongolian satellite. The roles of Mongolian engineers in the project are divided into designing and developing a camera subsystem for the BIRDS satellites, in Electrical Power System in Productive section and Interface management in non-productive section of Satellite Development as well as in On-board Computer (OBC) system to provide reliable and proper operation of the brain for the satellites. On February 8, a press conference was held to deliver the "Mazaalai" satellite to the Japanese Aerospace Exploration Agency. The satellite will soon be transferred to NASA to be sent into space along with the regular supplies of the International Space Station in SpaceX rocket. Although the exact date is still unknown due to weather and other factors, the flight is scheduled in March. The miniature satellite is capable of taking 100m resolution images in the altitude of around 400km, transmitting data through 437MHz frequency modulation, identifying satellite locations, determining air density in the altitute of 400km, detecting space radiation and using ground stations as an international network. February 14 (American Center for Mongolian Studies) The ACMS Office will be closed on Monday, February 20th for President's Day. We will resume normal operations on Tuesday, February 21st. February 14 (news.mn) Viktoria Raidos, winner of the 16th season of Russia's "Battle of the Psychics" TV show, will visit Mongolia on 3rd of March. She came to Mongolia for the first time last year. In Ulaanbaatar, Viktoria Raidos will give a presentation about black magic and voodoo at the "SS Club" at 4.00 p.m. The number of participants is limited to 500 people. "Battle of the Psychics" is considered as a magicians' Olympus. The name of Viktoria Raidos stands among the best healers in Russia. She is also a practicing magician and healer and teaches at the St. Petersburg Tarot Academy. February 13 (American Center for Mongolian Studies) Setting out this summer with support from the ACMS Summer Field Research Fellowship I was eager to shoot 360 video to capture the stories of rural-urban migrants living on the outskirts of Ulaanbaatar. As I discovered, there was a steep learning curve! Many of my lessons-learned while in the field are worth sharing with anyone planning to produce non-fiction video stories in Mongolia, regardless of the medium. The goal of my ongoing Master's of Journalism project is to create an interactive project introducing global audiences to the challenges and resiliency of herders transitioning to sedentary urban lifestyles. While roughly a quarter of Mongolians live nomadically, each year tens of thousands of herders choose to lead sedentary lifestyles, moving to villages, towns, or the nation's capital. While Mongolia is one of the world's least densely populated countries, about three quarters of its population live in urban areas. Nearly half of the nation's more than 3 million people live in the capital city alone. Though my project will not be complete until May 2017, this post outlines some general tips for my fellow documentarians planning projects in Mongolia. Lesson 1. Access is everything! Once there is a clear vision and mission for the project, the first task is to connect with the people who will be the protagonists of the story, so to speak. For journalists, this means finding "sources" and planning ways to cultivate trusting relationships with them in a short period of time. The role of the ACMS in helping to facilitate this process cannot be understated. Their extensive networks proved invaluable to reaching the people I later interviewed over the course of the summer. They also provided support in coordinating my budget and timeline as well as in finding excellent drivers and translators, without whom my project would not be possible. Lesson 2. Get comfortable with the gear. Practice, practice, practice. While in the field, you need to know your equipment like the back of your hand. If you don't, you're in big trouble! After all the exhausting work arranging drivers, translators, itineraries and interview subjects—not to mention the taxing journeys to get there—there is no time to second-guess yourself on which buttons to press. It's not only going to result in poor footage or audio but it can easily erode confidence and rapport with your interviewees. Lesson 3. Take a crew if you can, especially for 360. While it is certainly exciting to be off on your own on a shoot, it can become overwhelming trying to operate multiple cameras and audio feeds while conducting interviews. I would highly recommend bringing a trained cameraperson for helping with filming, regardless of the medium. While many drivers and translators are more than happy to assist with hauling around gear, they are not experts in the production process. Once it's time to start filming, you don't have time to teach them how to assist you. Lesson 4. Charge your batteries, bring extras. Same for SIM cards. These all go without saying for professional videographers and journalists. As a student, I certainly learned the hard way the puny amount of time that 360 camera batteries last and quickly reached the limits of the SIM cards and micro-SDs I took with me. Cutting short a filming session due to these mistakes after hours en-route and days of preparation is excruciating. Most cameras tend to have trouble with transitions between temperatures. Six Go Pros in a 3D-printed cube tend to overheat under ideal conditions, but they're even more likely to fry if you're out in direct sunlight or inside and near a heat-source—a ger stove for example. Regular video cameras or DSLRs sometimes have trouble with overheating, but both 360 rigs I used were extremely prone to shutting down unexpectedly. At times I shot entire sequences only to discover I'd lost the footage due to one camera or another overheating or running out of battery. Lesson 5. Allow time to find good subjects who are representative of a larger narrative, and then adapt the story as needed. Non-fiction filmmaking is difficult and time-intensive. When chronicling any non-fiction story, it's incredibly important to not oversimplify an issue for the sake of convenience. Falling back on familiar stereotypes, tropes, and formulaic narratives is laziness and shoddy journalism. On the other hand, narrowing the scope of the story to find the thread of narrative arc or central tension can prove extremely difficult. Not only do we inhabit a complex world, human experience is very hard to convey accurately and succinctly. Be sure to plan enough time to develop the relationships with the people you're filming, and make sure you fully understand their story and are sharing it responsibly—and not imposing your own upon them! I look forward to sharing my finished project in the coming months with the ACMS community! For the second year in a row (2016/2017 winter), Mongolian families are facing a severe winter, known as a dzud. Despite a fairly good summer, heavy early snow falls in October 2016 followed by plummeting temperatures towards the end of the year, left a layer of ice on the ground, making it very difficult for livestock belonging to the country's 153,085 herder households (17.8% of total households of Mongolia) to graze. The heavy snow cover has also disrupted transportation and pushed consumption of fuel up, impacting the normal operation of education and healthcare services during the winter. Temperatures are expected to fall sharply again in a few days' time, from 18th January 2017. Local level preparedness particularly on reserve of hay and fodder is not sufficient due to consecutive severe winter and budgetary constraints. Save the Children's assessment has found that the most vulnerable households, particularly herder households, are already struggling to cope with the impact of a second severe winter in a row; most herders have a loan from the bank and buy food on credit from local markets. Children – especially those from herders' families - are expected to be particularly affected by this crisis; the usually long journey to school at the beginning of term is now more dangerous, their schools and dormitories are incredibly cold, and respiratory infections are common, but access to healthcare is very poor. With their parents' struggling financially, children are arriving at school without warm clothes and without money to properly look after themselves, not to mention the psychological impacts of being separated from their parents for longer than expected with little or no means of communication. In response to this situation, Save the Children proposes to implement a multi-sector programme aiming to protect livelihoods of most vulnerable herder households while ensuring the basic education and health services are provided to affected children. February 14 (Evening Express) An intrepid Aberdeen student has travelled to the wilds of Mongolia to study one of the world's most elusive animals. Zara Morris-Trainor faced bone-chilling winter temperatures of -20C as she lived in a tent for nine months and worked with nomadic herders to examine the relationship between rarely-sighted snow leopards, ibex and livestock. Working together with the Snow Leopard Trust in Mongolia, Zara, 29, was able to interview herders while she was in the field tracking ibex to investigate the effects grazing has on the local ecosystem. Zara's visit to the East Asian country was made possible thanks to a scholarship in memory of North-east ice cream tycoon Maitland Mackie. Originally from New Zealand, Zara moved to the UK four years ago for her Masters in conservation biology and is now undertaking her doctorate at the University of Aberdeen, where she applied for the Sir Maitland Mackie Scholarship. She said: "I'm so grateful to get backing in the form of this scholarship, as without vital funding like this it simply wouldn't be possible to conduct my research in this way." Her research has focused on the sustainability of cashmere production and the impact increasing livestock numbers are having on the native animal populations. Herders have expanded their goat numbers as global demand for cashmere has increased, which may be negatively affecting the survival of native grazing species such as ibex, a wild goat species, and mountain sheep known as argali, plus endangered predators like the snow leopard. Zara's study aims to highlight how changing market forces, in this case cashmere, can impact both people and wildlife on the local level. Zara committed to an authentic Mongolian experience, spending the last nine months living in a ger – a traditional Mongolian tent – alongside native nomadic herders in the Tost Nature Reserve. And although she didn't sight any of the elusive snow leopards, she did spot their markings. Speaking about her time on the reserve, Zara said: "It has been an incredible experience in every way. From the stunning landscape to the phenomenal people I've met. "Even -20C weather this winter couldn't put a dampener on the experience." Zara said she came away from the experience with a new-found taste for Mongolian cuisine, such as suutei tsai (salted milk tea), aarul (dried curd) and boiled goat meat. She said: "Mongolian food is a bit polarising but I still find myself craving a cup of suutei tsai as a pick-me-up, whether it's sweltering or freezing outside. "Some of the more unusual meats like camel and horse are delicious and the herders make an amazing variety of dairy products – although it can't beat the ice cream back home!" Businessman Maitland Mackie held the position of rector at the University of Aberdeen at the time of his death in 2014. Mr Mackie left £100,000 in his will for the creation of a scholarship carrying his name and that of his late wife Halldis. With the aim of promoting research into renewable energy, environmental land use and sustainability, the Maitland and Halldis Mackie Scholarship was set up by the university in 2015. Mac Mackie, their son and managing director of Mackie's of Scotland, said: "Dad had great faith in the next generation – of people and of technology – and believed that with the right support structures in place they would solve some of the planet's most troubling issues. "It is a source of immense pride that our parents' scholarship will continue to provide a little help for people like Zara who are shining a light on our impact on some of the most incredible creatures." February 14 (Live Science) A critically endangered species of antelope is dying by the thousands from a deadly infectious disease outbreak in Mongolia, and scientists fear there could be "catastrophic consequences" for the threatened animals and their ecosystem. February 13 (Inside the Games) The Mongolia National Olympic Committee (MNOC) has vowed to back baseball/softball and karate in the country as the sports prepare for Tokyo 2020. Both sports were added to the Tokyo 2020 sport programme last year, after the International Olympic Committee (IOC) approved proposals from Japanese organisers. Skateboarding, sport climbing and surfing were also added to the programme. MNOC have now pledged their support to the country's governing bodies for baseball/softball and karate. The organisation's vice-president Ts. Damdin and secretary general J. Otgontsagaan met representatives from both federations. After presentations, MNOC confirmed they would support the organisations by arranging for Olympic Solidarity technical courses for coaches and team support grants. The possibility of achieving qualification in the sports for the Tokyo 2020 Olympics was among the topics discussed. The country face a tough task qualifying for the six team men's baseball and women's softball competitions, with their national teams currently ranked at 56 and 38 respectively. Participating in the Jakarta-Palembang 2018 Asian Games was also a topic of discussion. Baseball/softball and karate will both be on the sport programme for the Games in Indonesia, which will take place from August 18 to September 2 next year. The country is yet to secure a medal in either sport at the multi-sport event. Ulaanbaatar, February 14 (MONTSAME) State Honored Athlete Usukhbayar Gotovdorj has begun preparations for his attempt to conquer K2 or Mount Godwin-Austen in Pakistan, the second highest mountain in the world after Mount Everest (8848m). With 8611 metres elevation above sea level, K2 is also called the Savage Mountain and is the second most difficult mountain to climb. Mountaineers agree that the difficulty of ascent to K2 is higher than to Mount Everest. G.Usukhbayar is the first Mongolian to have ever set foot on Mount Everest, the highest mountain in the world. He has recently conquered Mount Aconcagua, the highest peak of South America after recovering from a major injury. K2 hasn't been conquered by a Mongolian mountaineer so far. State Honored Athlete, Mongolia's first Seven Summiteer B.Gangaamaa previously attempted to conquer the mountain, but had to stop her climb at 7000 metres due to inevitable reasons. Hamburg, February 2017 (APPLICATIO) For many years APPLICATIO has already been sponsoring and supporting youth soccer in Mongolia, especially the Club UB-United that supports mainly young players form disadvantaged families. Only since weeks, the Club is now member of the Mongolian Football Federation and all teams compete in official leagues! A good reason to come up with new dresses. Ulaanbaatar, February 14 (MONTSAME) The 3rd '10000 Horses' festival is going be held on February 18-19 in Altanbulag soum of Tuv aimag in connection with the 30th anniversary of the Ministry of Environment and Tourism. The event is extraordinary for it offers a chance to see the biggest horse herd in one place. Aiming to develop winter tourism in Mongolia, the event will feature number of interesting competitions such as snatching uurga (lasso pole), lasso pole performance, (buguil) lasso performance and best singer of horse songs. E.Tserenbat, Head of 'Eternal Communion' NGO which initiated the festival also added that short distance horse race and cavalry stunt performances are to be expected. "An event starts attracting tourists after it is held for consecutive 5 years, if we look at international examples. But our festival is going to be held for the third year, and tourists from over 10 countries have applied to come and experience the '10000 horses' festival. This shows that our event is already fulfilling its purpose to advance winter tourism in Mongolia", he said. Moreover, local people will organize an expo showcasing traditional Mongolian crafts, souvenir and home-made products during the festival. Journey to Mongolia's wild west for an incredible and unique nomadic experience. You'll stay in ger camps with local nomadic families, set against the vast landscapes of the Bayan-Olgiy region. This remote area of Mongolia that lies close to the border with Russia and Kazakhstan is still untouched by mass tourism and honest to its cultural roots and traditions; hunting for food and fur with golden eagles are still very much alive in Bayan Olgiy. During your stay here you'll learn how to master the art of hunting with these majestic birds on horseback, a thrilling, ancient practice that few people get the chance to experience. You'll arrive in Mongolia's capital, Ulaanbaatar, and be met by your guide for the next few days. A heady mix of traditional and modern, the flowing eaves of monastery temples stand beside communist planned courtyards and modern skyscrapers. Take the day to explore the city. The Museum of National History is a must for gaining an understanding of Mongolia's remarkable past. In the evening sample the delicious local food in one of our favourite Mongolian restaurants. Early the following morning you'll be taking a flight to Ulgii to arrive around breakfast time. The capital of the westernmost aimag, Ulgii is a predominantly Kazakh city where a Muslim influence is widespread, from street signs to clothes and food, and gives the town its diverse atmosphere. You won't linger here for long and soon will be driving east to Altantsogts, stopping at Oni mountain to see the nests where eagles lay their eggs in early March. At Altantsogts you'll meet with your host for the next two nights: the Eagle Hunter, his family and his magnificent bird. You'll experience the warm and welcoming Kazakh hospitality and authentic nomadic lifestyle. One of the most experienced hunters in the region, the Eagle Hunter will be your instructor in the nomadic way of life in this hostile environment. Amid arid, yet strikingly beautiful landscapes the nomadic hunters have a traditional way of life that has been shaped by history, geography and political change. You'll take lessons with the Eagle Hunter learning the unique skills and techniques of eagle hunting before embarking on a hunt. With a backdrop of snowcapped mountains and breathtaking glaciers you'll set off on horseback, or foot, and trek deep into the Altai Mountains to begin the hunt. Keep your eyes peeled as the eagles soar to monumental heights before swooping down to catch rabbits or foxes. A practice that has unfolded over hundreds of years, it's a way of existence that the hunters have had to learn. Master and bird have an intimate relationship which builds up over 20 years of trust. As legend goes; the man trains the eagle, so does the eagle train the man. For a deeper insight into these communities you can meet a shaman who will give you an idea of local rituals. From here it will be back to Ulgii and Ulannbaatar for your departure home full of incredible memories.